GURPS uses a hit location and when I saw the hit location for Roll Arena my first thought was that it was very close to GURPS but not quite. I made the vitals as inlayed semi-precious stone, Malachite for the lungs, Turquoise for the kidneys and Rose Quarts for the Heart then I tried to add as close as possible the same brass border around them. I like how you've used stone textures - looks very nice! I personally haven't used this type of wheel much at all, and am still not sold on it is a way of identifying a target... I'm interested to hear some anecdotes others may have. "...just a ghost in the machine..."
Plus the lungs and the heart are a lot bigger. I want to continue to use the traditional hitlocation system from GURPS, but a reminder for all those modifiers is helpful. 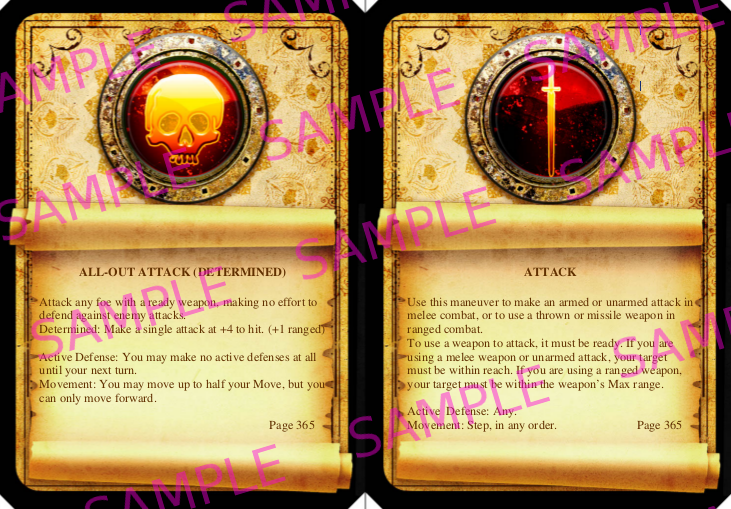 I'm also adapting the Combat Cards to the cards included with the rollarena. I'm also adapting the Combat Cards to the cards included with the rollarena. So am I! 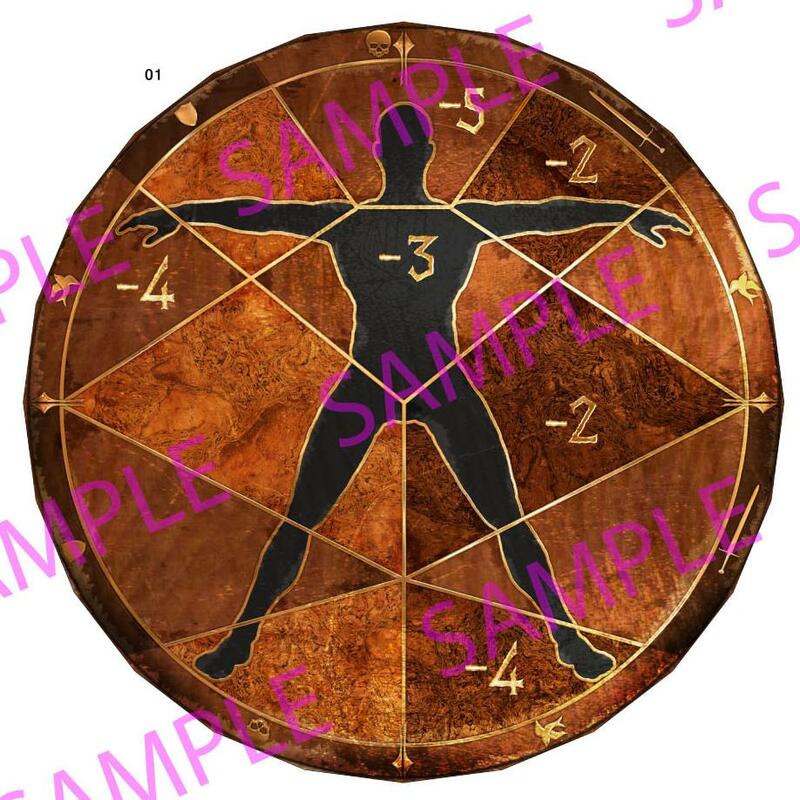 I've decided to remake the 4e Combat Cards with some new additional maneuvers from Martial Arts, then I'm going to make a series of Technique, Advantages, Disadvantage cards (well the ones that would apply to having a card made, not all of them). That should take care of the bulk of combat. Once those are done I'm moving on to Magic, Psi, and Powers. Then I will worry about item cards. Here is my first run. I am changing the background a bit on this card. I did that as well, I have a whole set using the original textures. But I found I wanted more room for writing. I still have not decided what to do with the numbered cards. I guess I''ll use the numbered cards for spells. A friend of mine has a System with different spheres, numbered, so that would be a good fit. Highland piper, how can a get a version of you hit location table without sample on it? Not sure how often Highland piper checks the forum these days. You might get a faster response (and less chance he misses your request) by PM'ing him directly. Yeah PM is the only way. Since the indefinite Hiatus I don't really come here any more. In fact I'm kind of getting out of doing paper terrain these days. Oxfordshire weather is hell on paper models and I just don't have the place to store them indoors so they always get wrecked in the garage. I lost this file earlier this year do to a hard drive crash.